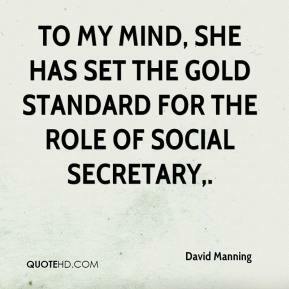 To my mind, she has set the gold standard for the role of social secretary. 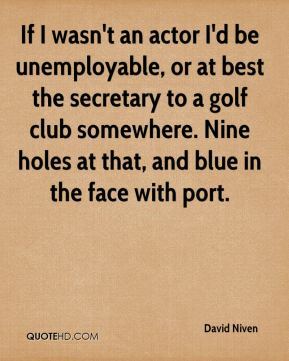 If I wasn't an actor I'd be unemployable, or at best the secretary to a golf club somewhere. Nine holes at that, and blue in the face with port. 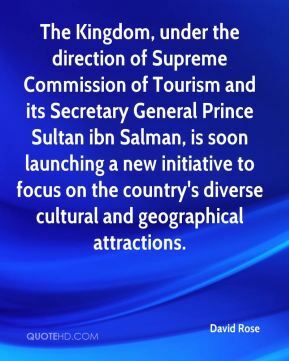 The Kingdom, under the direction of Supreme Commission of Tourism and its Secretary General Prince Sultan ibn Salman, is soon launching a new initiative to focus on the country's diverse cultural and geographical attractions. 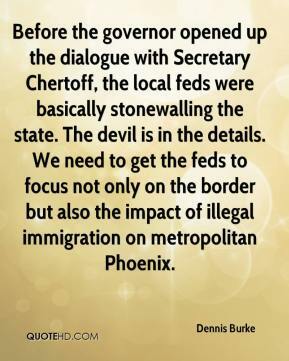 Before the governor opened up the dialogue with Secretary Chertoff, the local feds were basically stonewalling the state. The devil is in the details. We need to get the feds to focus not only on the border but also the impact of illegal immigration on metropolitan Phoenix. [Also on the tapes, Dean Rusk, Kennedy's secretary of state, counsels that the use of nuclear weapons would have to have support from America's allies.] 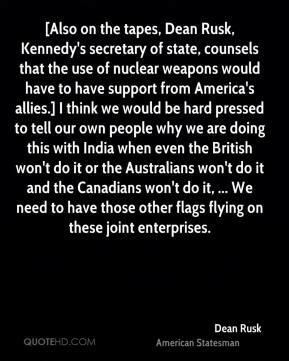 I think we would be hard pressed to tell our own people why we are doing this with India when even the British won't do it or the Australians won't do it and the Canadians won't do it, ... We need to have those other flags flying on these joint enterprises. 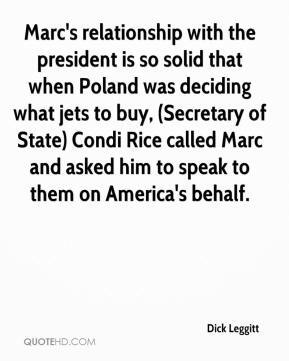 Marc's relationship with the president is so solid that when Poland was deciding what jets to buy, (Secretary of State) Condi Rice called Marc and asked him to speak to them on America's behalf. 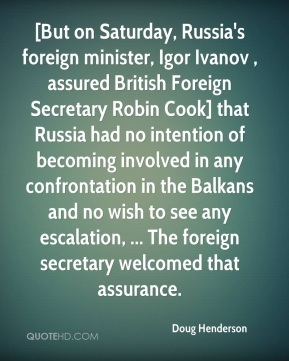 [But on Saturday, Russia's foreign minister, Igor Ivanov , assured British Foreign Secretary Robin Cook] that Russia had no intention of becoming involved in any confrontation in the Balkans and no wish to see any escalation, ... The foreign secretary welcomed that assurance. 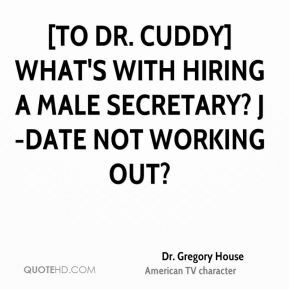 [To Dr. Cuddy] What's with hiring a male secretary? J-Date not working out? 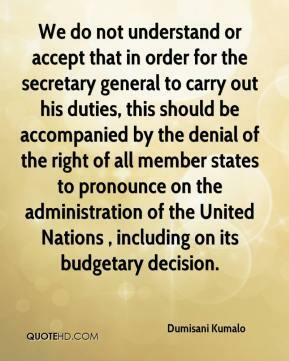 We do not understand or accept that in order for the secretary general to carry out his duties, this should be accompanied by the denial of the right of all member states to pronounce on the administration of the United Nations , including on its budgetary decision. 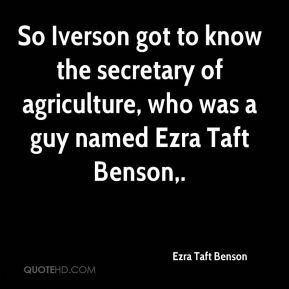 So Iverson got to know the secretary of agriculture, who was a guy named Ezra Taft Benson. 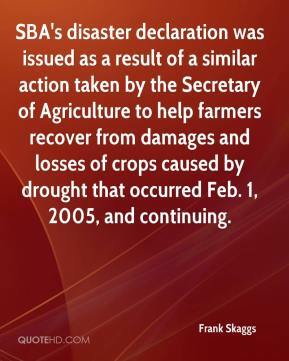 SBA's disaster declaration was issued as a result of a similar action taken by the Secretary of Agriculture to help farmers recover from damages and losses of crops caused by drought that occurred Feb. 1, 2005, and continuing. 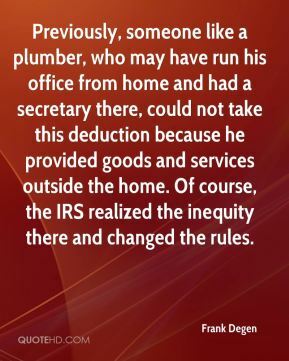 Previously, someone like a plumber, who may have run his office from home and had a secretary there, could not take this deduction because he provided goods and services outside the home. Of course, the IRS realized the inequity there and changed the rules. 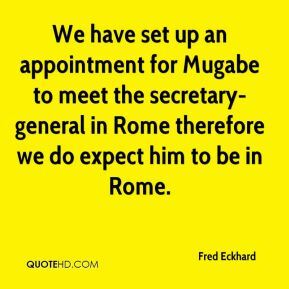 We have set up an appointment for Mugabe to meet the secretary-general in Rome therefore we do expect him to be in Rome. 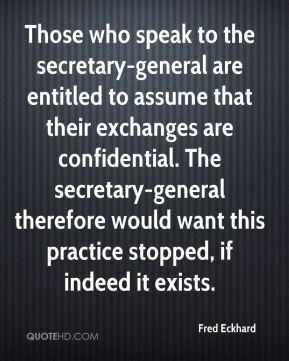 Those who speak to the secretary-general are entitled to assume that their exchanges are confidential. The secretary-general therefore would want this practice stopped, if indeed it exists. We cannot but welcome this effort of the Secretary General. It is something the President of the Republic himself has repeatedly requested from the Secretary General. Our effort is to avoid a hasty new process of negotiations,which would fail in no time, because that would be a catastrophe for Cyprus. 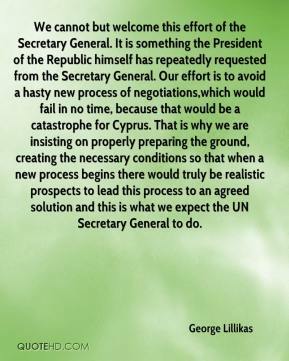 That is why we are insisting on properly preparing the ground, creating the necessary conditions so that when a new process begins there would truly be realistic prospects to lead this process to an agreed solution and this is what we expect the UN Secretary General to do. 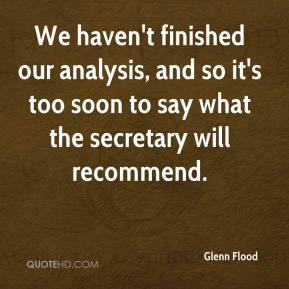 We haven't finished our analysis, and so it's too soon to say what the secretary will recommend. 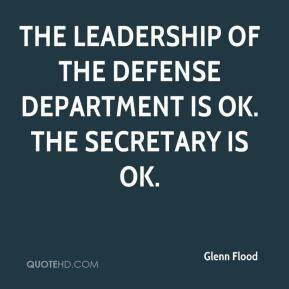 The leadership of the Defense Department is OK. The secretary is OK. 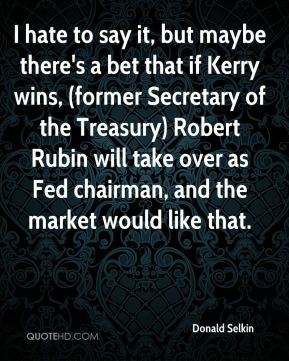 It does not surprise me that the new secretary would take a look at that situation. 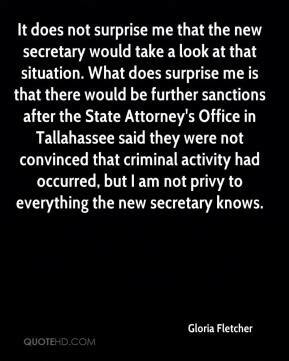 What does surprise me is that there would be further sanctions after the State Attorney's Office in Tallahassee said they were not convinced that criminal activity had occurred, but I am not privy to everything the new secretary knows. 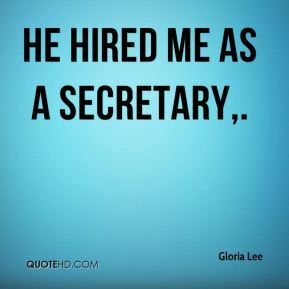 He hired me as a secretary. 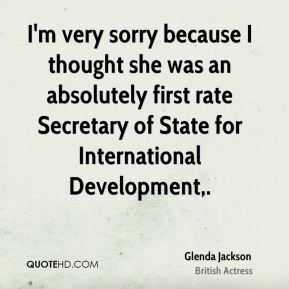 I'm very sorry because I thought she was an absolutely first rate Secretary of State for International Development. 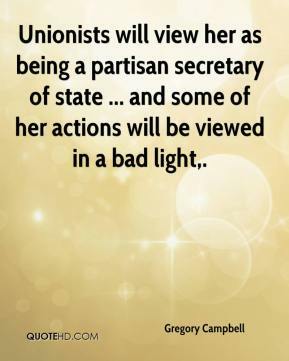 Unionists will view her as being a partisan secretary of state ... and some of her actions will be viewed in a bad light. 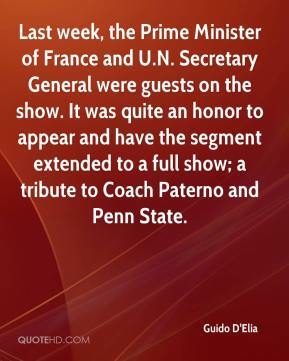 Last week, the Prime Minister of France and U.N. Secretary General were guests on the show. It was quite an honor to appear and have the segment extended to a full show; a tribute to Coach Paterno and Penn State. 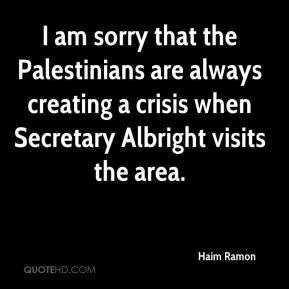 I am sorry that the Palestinians are always creating a crisis when Secretary Albright visits the area. 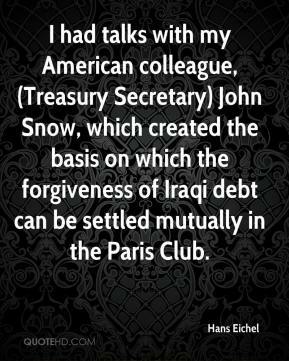 I had talks with my American colleague, (Treasury Secretary) John Snow, which created the basis on which the forgiveness of Iraqi debt can be settled mutually in the Paris Club.